The ice-dancing champions led a 225-strong Team Canada. Flag bearers Tessa Virtue and Scott Moir of Canada lead the team during the Opening Ceremony of the PyeongChang 2018 Winter Olympic Games, on Friday in Pyeongchang, South Korea. Canadian ice dance darlings Tessa Virtue and Scott Moir took turns carrying Canada's flag in the 2018 Olympic Games opening ceremony in PyeongChang Friday, and it was Virtue who had the first honour. Virtue and Moir are the first-ever Canadian dual flag-bearers to carry Canada's flag into the Olympic Games opening ceremonies. The Olympic gold-medallists were announced as flag-bearers last month at a news conference in Ottawa, with Prime Minister Justin Trudeau there to mark the occasion. 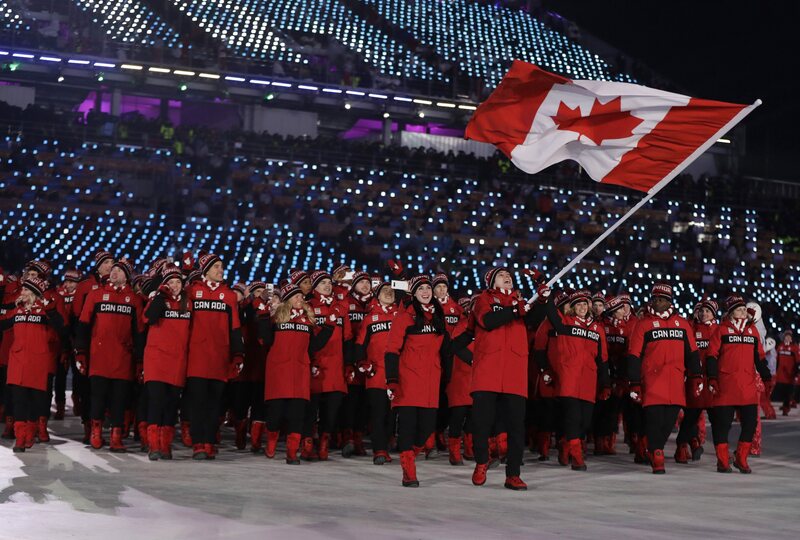 Moir carried the flag during the second-half of Team Canada's walk around the stadium. Virtue, 28, and Moir, 30, have been skating together for 20 years. They made their Olympic debut in Vancouver eight years ago, where they skated to a gold medal. They won silver in Sochi in 2014. The pair announced that they will retire after this year's Games in Pyeongchang. South Korea and North Korea also had a duo carrying the flag as the two teams marched in together carrying a unification flag. Members of Canada team during the Opening Ceremony of the PyeongChang 2018 Winter Olympic Games on Friday. The Canadians waved to the crowd, snapped selfies and danced to the music, but like the rest of the countries in the parade nations, they moved a little faster than usual to get to their seats — probably because of the cold. Canada is taking part in 15 sports in South Korea and has been projected by data analysts to beat its previous high of 26 medals set eight years ago in Vancouver. The best early opportunity at a podium finish comes Saturday in short-track speedskating with Charles Hamelin of Sainte-Julie, Que., in the men's 1,500 metres, and at the long-track oval where Ottawa's Ivanie Blondin is set to race in the women's 3,000. Trudeau wished Canada's athletes good luck in a statement released Friday and said the team's diverse makeup is a reflection of the country. "When Team Canada marches into the Pyeongchang Olympic Stadium, young Canadians can look at our team and see themselves," Trudeau said. "Our Olympians hail from across the country and from all kinds of different backgrounds. "Together, they represent the diversity that Canada so proudly stands for, and remind us all that no matter where we are from, we can succeed with drive and discipline."